Halloween will be here before we know it. You’ll be doing a few costume changes between trick-or-treating, classroom parties, and neighborhood celebrations. While it’s tempting to bring along fun-sized candy to share at each gathering, a refreshing recipe is sure to please your guests. If you fear coming up with terrifying treats, these easy recipes will make your fright disappear. Better yet, each ingredient can be found at your local Fresh Market! We won’t keep this recipe under wraps. 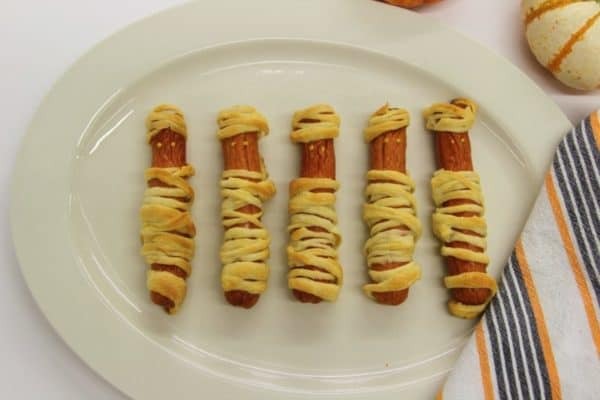 Your kids will devour these delicious mummies. 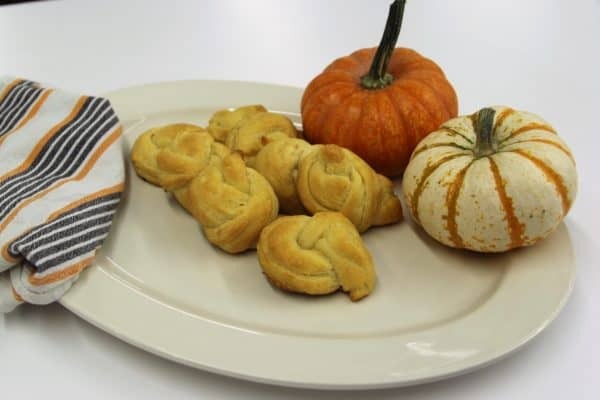 Open the pack of crescent rolls and divide the dough along the outlined ridges. With a pizza cutter, cut the triangles into strips. Take one strip and wrap it around a hot dog. Leave a small exposed space on one end of the hot dog. Place onto a cooking spray-covered baking sheet. Repeat with the other hot dogs. Crack one egg and beat in a small bowl. Brush each mummy with beaten egg wash.
Bake the hot dogs at 350 degrees for 15 minutes or until the mummies become a golden brown. Allow to cool for several minutes. With a tooth pick, dot two eyes on the mummies using ketchup or mustard. Serve with additional mustard, ketchup, and relish. Let’s face it. A whole caramel apple is a feat to eat. This dip turns the Halloween staple into a convenient snack. In a medium mixing bowl, combine cream cheese and caramel topping until well mixed. Place mixture into serving dish and serve with apple slices. Few dinners are more kid pleasing than quesadillas. 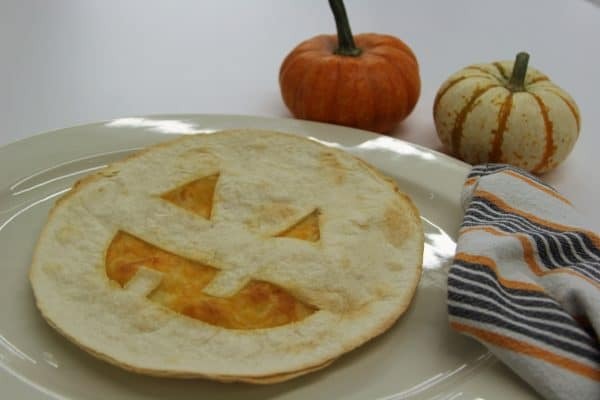 These Jack-o’-lantern quesadillas can be silly or scary–get creative with your design! On a greased baking sheet, lay out two large tortillas. Spread shredded Mexican cheese on each one. On a cutting board, use a sharp knife to cut Jack-o’-lantern faces into two tortillas. For the eyes, cut out two equally sized triangles on one half of the tortilla. To make the mouth, cut out a half circle with a tooth or two jutting out. Bake the Jack-o’-lanterns at 375 degrees for five to seven minutes or until they are golden brown. Cut into quarters and serve. There’s no toil or trouble in this punch bowl–only delicious, fizzy bubbles. In a punch bowl, pour one liter of lime soda. Add the sherbet scoop by scoop into the soda. Set out a ladle and cups to allow guests to serve themselves. These are garlic knots are full-proof easy and delicious. Melt five tablespoons of butter. Mix in the tablespoon of minced garlic. Take each triangle of dough and roll into a long rope shape. Take the rope of dough and dunk it in the butter mixture. Finally, knot the rope of dough and place on a parchment-lined baking sheet. Continue with each dough rope. Bake about 13 to 15 minutes. After removing the knots from the oven, coat the rolls with the remaining two tablespoons of butter. Sprinkle with grated Parmesan cheese and serve. The Braum’s Fresh Market is all about convenience. You’ll find that it’s the perfect place to grab milk, eggs, a quart or two of your favorite Braum’s ice cream flavor… or everything you need for some Halloween treats! But don’t stop with these recipes! Pick up enough pies, cookies, and brownies to please every trick-or-treater.